As a mastering and mixing engineer for electronic music I want your music to be successful and your songs to be heard as often as possible. With so many musicians it is essential to promote your songs in the best possible way. Very essential is that you continuously communicate with your fans and followers. If you publish your music yourself and don't have a big label working for you in the background, you have to draw attention. According to the statistics of some marketing experts, it takes between 5 and 7 contacts with your listeners until you win new fans as a musician or DJ. Your artist name has to be noticed, that is the most important thing. So that you don't get lost in the crowd, you should post 3 to 5 times a week at social media. If possible even daily! If you decide to use social media, then spread content consistently and regularly. Or be satisfied that only your friends and acquaintances listen to your music. You can decide for yourself. However, don't just worry about your social media appearance, much more important is to dedicate yourself to your music and to be creative. Set yourself the goal to use 30 to 60 minutes a day for social media and not more. Instead of checking your likes every 2 minutes, do something constructive! If you as an artist do not only attract online audiences, you have a big advantage. Are you regularly active with your band at concerts, or do you regularly play in clubs as a DJ or music producer? Online contacts to your fans are very desirable. However, even more important would be if your music is listened to at concerts, or through personal contacts. In any case, the probability of success is higher if you are regularly heard within a short period. Contacts with fans include: being heard in a club or at a concert, someone having listened, liked and shared your song on Spotify or Soundcloud, or your contributions being seen on social networks like Instagram or Facebook. To get the most out of your Instagram Hashtags, you need to add them to your post immediately, not minutes later. If the quality of your posts is right and you post your content not only when everyone is asleep or working, you will quickly notice success. 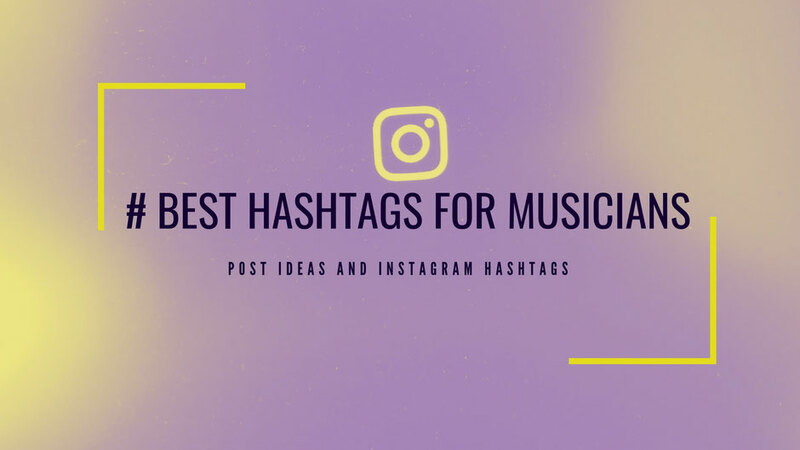 Try the following hashtags on your next instagram music post. Soon you will achieve over 100 likes and can spread your music to all countries. What to post on Instagram? Get post ideas for your Instagram account; this works for creative people and artists. Try to establish a direct and personal contact that has more value for others. Don't just talk about yourself, but try to be responsive to your fans and followers. You can also ask what content your fans want more. Here are some content ideas for your Instagram, Facebook or Youtube Channel. Try which Instagram Content works for you and what doesn't. Compare the results, learn and get better! Soon you will have more followers and a greater range. With good content, you will quickly generate your first 100 likes. You may wonder when is the best time, to post Instagram content? Of course, you have to consider which country your posts should be optimized. Whether for the time zones in America, Europe or the Asian market in India, China or Australia. According to various statistics, Instagram Content interacts very well in the morning. 7 am to 10 am: Shortly after people get up or on their way to work, it's usually time to take a look at the mobile phone. At lunchtime, on the other hand, not so many interactions take place. From late afternoon/evening around 4 pm, most people have more time to look at Instagram again. So you already have an overview when it might be most rewarding to do Instagram marketing. One of the most successful weekdays on which your Instagram post has the most reach is Tuesday, Wednesday and Thursday. Less frequented days are Monday and Sunday. Average engagement rates for likes and comments are expected on Friday and Saturday. However, it is still best to test which days and times work best for your Instagram target group. To find out when they are most likely to be online and not overlook your posts.